I seem to be on a monochromatic kick. I didn't intended for that to happen, it just did. The Documented Life Project prompt was used five layers. My layers are gesso, tissue paper, embossing paste, paint and sharpie markers. In some areas I used more than one layer of tissue paper. I love how those areas turned darker. 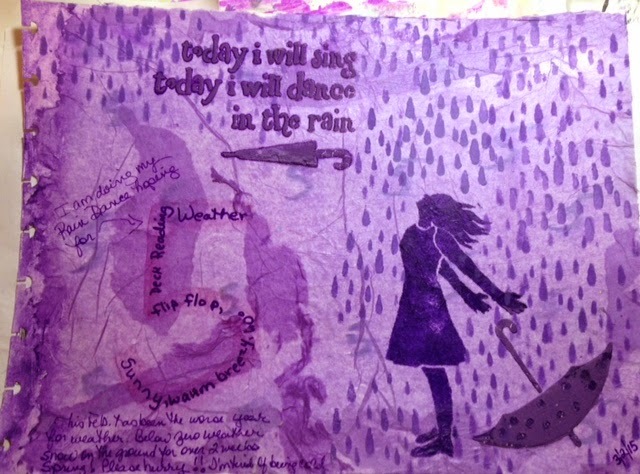 The girl, words and rain are from a Stencil Girl stencil. When I did the purple page, we were having ice, snow and extremely cold weather. I decided I was doing a rain dance. My five is made up of the things I was hoping to produce with my rain dance. They are sunny, warm, breezy, flip flop, deck reading weather. 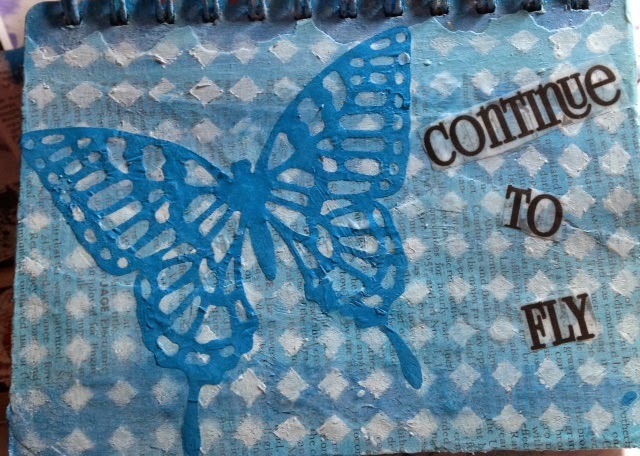 The butterfly page is in my Altered Cookbook journal. The butterfly is a die cut from Stampin Up. It is actually cut from wax paper and painted with blue craft paint. The background is the same blue paint mixed with gesso to lighten it a bit. The diamond are part of a Stencil Girl stencil. On the other side of the blue butterfly is a really ugly page. I wish I'd taken pictures as I worked so you could see all the things I tried. I've worked on it for three days now and nothing seems to help it. I may paint over the page or cover it with book text. I'll post it when I'm finished.... How's that for an art journal cliff hanger?